Cows on Selsley Common. The “tragedy of the commons” is one way of accounting for overexploitation. The tragedy of the commons is a situation in a shared-resource system where individual users acting independently according to their own self-interest behave contrary to the common good of all users by depleting or spoiling that resource through their collective action. 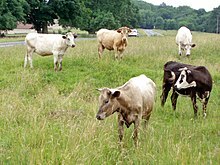 The theory originated in an essay written in 1833 by the British economist William Forster Lloyd, who used a hypothetical example of the effects of unregulated grazing on common land (also known as a “common”) in Great Britain and Ireland. The concept became widely known as the “tragedy of the commons” over a century later due to an article written by the American ecologist and philosopher Garrett Hardin in 1968. In this modern economic context, commons is taken to mean any shared and unregulated resource such as atmosphere, oceans, rivers, fish stocks, roads and highways, or even an office refrigerator. The term is used in environmental science.The “tragedy of the commons” is often cited in connection with sustainable development, meshing economic growth and environmental protection, as well as in the debate over global warming. It has also been used in analyzing behavior in the fields of economics, evolutionary psychology, anthropology, game theory, politics, taxation and sociology. Although common resource systems have been known to collapse due to overuse (such as in over-fishing), many examples have existed and still do exist where members of a community with access to a common resource co-operate or regulate to exploit those resources prudently without collapse. Elinor Ostrom was awarded the Nobel Prize in economics for demonstrating exactly this concept in her book Governing the Commons, which included examples of how local communities were able to do this without top-down regulations. It has been argued that the very term “tragedy of the commons” is a misnomer since “the commons” referred to land resources with rights jointly owned by members of a community, and no individual outside the community had any access to the resource. However, the term is now used in social science and economics when describing a problem where all individuals have equal and open access to a resource. Hence, “tragedy of open access regimes” or simply “the open access problem” are more apt terms. In 1833, the English economist William Forster Lloyd published a pamphlet which included a hypothetical example of over-use of a common resource. This was the situation of cattle herders sharing a common parcel of land on which they are each entitled to let their cows graze, as was the custom in English villages. He postulated that if a herder put more than his allotted number of cattle on the common, overgrazing could result. For each additional animal, a herder could receive additional benefits, but the whole group shared damage to the commons. If all herders made this individually rational economic decision, the common could be depleted or even destroyed, to the detriment of all. In 1968, ecologist Garrett Hardin explored this social dilemma in his article “The Tragedy of the Commons”, published in the journal Science. The essay derived its title from the pamphlet by Lloyd, which he cites, on the over-grazing of common land. The Universal Declaration of Human Rights describes the family as the natural and fundamental unit of society. [Article 16] It follows that any choice and decision with regard to the size of the family must irrevocably rest with the family itself, and cannot be made by anyone else. In addition, Hardin also pointed out the problem of individuals acting in rational self-interest by claiming that if all members in a group used common resources for their own gain and with no regard for others, all resources would still eventually be depleted. Overall, Hardin argued against relying on conscience as a means of policing commons, suggesting that this favors selfish individuals – often known as free riders – over those who are more altruistic. In the context of avoiding over-exploitation of common resources, Hardin concluded by restating Hegel‘s maxim (which was quoted by Engels), “freedom is the recognition of necessity”. He suggested that “freedom” completes the tragedy of the commons. By recognizing resources as commons in the first place, and by recognizing that, as such, they require management, Hardin believed that humans “can preserve and nurture other and more precious freedoms”. Hardin’s article was the start of the modern use of “Commons” as a term connoting a shared resource. As Frank van Laerhoven & Elinor Ostrom have stated: “Prior to the publication of Hardin’s article on the tragedy of the commons (1968), titles containing the words ‘the commons’, ‘common pool resources,’ or ‘common property’ were very rare in the academic literature.” They go on to say: “In 2002, Barrett and Mabry conducted a major survey of biologists to determine which publications in the twentieth century had become classic books or benchmark publications in biology. They report that Hardin’s 1968 article was the one having the greatest career impact on biologists and is the most frequently cited”. Like Lloyd and Thomas Malthus before him, Hardin was primarily interested in the problem of human population growth. But in his essay, he also focused on the use of larger (though finite) resources such as the Earth’s atmosphere and oceans, as well as pointing out the “negative commons” of pollution (i.e., instead of dealing with the deliberate privatization of a positive resource, a “negative commons” deals with the deliberate commonization of a negative cost, pollution). As a metaphor, the tragedy of the commons should not be taken too literally. The “tragedy” is not in the word’s conventional or theatric sense, nor a condemnation of the processes that lead to it. Similarly, Hardin’s use of “commons” has frequently been misunderstood, leading him to later remark that he should have titled his work “The Tragedy of the Unregulated Commons”. The metaphor illustrates the argument that free access and unrestricted demand for a finite resource ultimately reduces the resource through over-exploitation, temporarily or permanently. This occurs because the benefits of exploitation accrue to individuals or groups, each of whom is motivated to maximize use of the resource to the point in which they become reliant on it, while the costs of the exploitation are borne by all those to whom the resource is available (which may be a wider class of individuals than those who are exploiting it). This, in turn, causes demand for the resource to increase, which causes the problem to snowball until the resource collapses (even if it retains a capacity to recover). The rate at which depletion of the resource is realized depends primarily on three factors: the number of users wanting to consume the common in question, the consumptiveness of their uses, and the relative robustness of the common. The same concept is sometimes called the “tragedy of the fishers”, because fishing too many fish before or during breeding could cause stocks to plummet. The tragedy of the commons can be considered in relation to environmental issues such as sustainability. The commons dilemma stands as a model for a great variety of resource problems in society today, such as water, forests, fish, and non-renewable energy sources such as oil and coal. Situations exemplifying the “tragedy of the commons” include the overfishing and destruction of the Grand Banks, the destruction of salmon runs on rivers that have been dammed – most prominently in modern times on the Columbia River in the Northwest United States, and historically in North Atlantic rivers – the devastation of the sturgeon fishery – in modern Russia, but historically in the United States as well – and, in terms of water supply, the limited water available in arid regions (e.g., the area of the Aral Sea) and the Los Angeles water system supply, especially at Mono Lake and Owens Lake. In economics, an externality is a cost or benefit that affects a party who did not choose to incur that cost or benefit. Negative externalities are a well-known feature of the “tragedy of the commons”. For example, driving cars has many negative externalities; these include pollution, carbon emissions, and traffic accidents. Every time ‘Person A’ gets in a car, it becomes more likely that ‘Person Z’ – and millions of others – will suffer in each of those areas. Economists often urge the government to adopt policies that “internalize” an externality. Clearing rainforest for agriculture in southern Mexico. Uncontrolled human population growth leading to overpopulation. A preference for sons made people abort foetal girls. This results in an imbalanced gender ratio. Light pollution – with the loss of the night sky for research and cultural significance, affected human, flora and fauna health, nuisance, trespass and the loss of enjoyment or function of private property. Spam email degrades the usefulness of the email system and increases the cost for all users of the Internet while providing a benefit to only a tiny number of individuals. Wi-Fi and its overcrowded 2.4Ghz channels. Vandalism and littering in public spaces such as parks, recreation areas, and public restrooms. Knowledge commons encompass immaterial and collectively owned goods in the information age. Including, for example, source code and software documentation in software projects that can get “polluted” with messy code or inaccurate information. Skills acquisition and training, when all parties involved pass the buck on implementing it. A parallel was drawn recently between the tragedy of the commons and the competing behaviour of parasites that through acting selfishly eventually diminish or destroy their common host. The idea has also been applied to areas such as the evolution of virulence or sexual conflict, where males may fatally harm females when competing for matings. It is also raised as a question in studies of social insects, where scientists wish to understand why insect workers do not undermine the “common good” by laying eggs of their own and causing a breakdown of the society. The idea of evolutionary suicide, where adaptation at the level of the individual causes the whole species or population to be driven extinct, can be seen as an extreme form of an evolutionary tragedy of the commons. From an evolutionary point of view, the creation of the tragedy of the commons in pathogenic microbes may provide us with advanced therapeutic methods. The commons dilemma is a specific class of social dilemma in which people’s short-term selfish interests are at odds with long-term group interests and the common good. In academia, a range of related terminology has also been used as shorthand for the theory or aspects of it, including resource dilemma, take-some dilemma, and common pool resource. Commons dilemma researchers have studied conditions under which groups and communities are likely to under- or over-harvest common resources in both the laboratory and field. Research programs have concentrated on a number of motivational, strategic, and structural factors that might be conducive to management of commons. In game theory, which constructs mathematical models for individuals’ behavior in strategic situations, the corresponding “game”, developed by Hardin, is known as the Commonize Costs – Privatize Profits Game (CC–PP game). Kopelman, Weber, & Messick (2002), in a review of the experimental research on cooperation in commons dilemmas, identify nine classes of independent variables that influence cooperation in commons dilemmas: social motives, gender, payoff structure, uncertainty, power and status, group size, communication, causes, and frames. They organize these classes and distinguish between psychological individual differences (stable personality traits) and situational factors (the environment). Situational factors include both the task (social and decision structure) and the perception of the task. Strategic factors also matter in commons dilemmas. One often-studied strategic factor is the order in which people take harvests from the resource. In simultaneous play, all people harvest at the same time, whereas in sequential play people harvest from the pool according to a predetermined sequence – first, second, third, etc. There is a clear order effect in the latter games: the harvests of those who come first – the leaders – are higher than the harvest of those coming later – the followers. The interpretation of this effect is that the first players feel entitled to take more. With sequential play, individuals adopt a first come-first served rule, whereas with simultaneous play people may adopt an equality rule. Another strategic factor is the ability to build up reputations. Research[by whom?] found that people take less from the common pool in public situations than in anonymous private situations. Moreover, those who harvest less gain greater prestige and influence within their group. Much research has focused on when and why people would like to structurally rearrange the commons to prevent a tragedy. Hardin stated in his analysis of the tragedy of the commons that “Freedom in a commons brings ruin to all.” One of the proposed solutions is to appoint a leader to regulate access to the common. Groups are more likely to endorse a leader when a common resource is being depleted and when managing a common resource is perceived as a difficult task. Groups prefer leaders who are elected, democratic, and prototypical of the group, and these leader types are more successful in enforcing cooperation. A general aversion to autocratic leadership exists, although it may be an effective solution, possibly because of the fear of power abuse and corruption. The provision of rewards and punishments may also be effective in preserving common resources. Selective punishments for overuse can be effective in promoting domestic water and energy conservation – for example, through installing water and electricity meters in houses. Selective rewards work, provided that they are open to everyone. An experimental carpool lane in the Netherlands failed because car commuters did not feel they were able to organize a carpool. The rewards do not have to be tangible. In Canada, utilities considered putting “smiley faces” on electricity bills of customers below the average consumption of that customer’s neighborhood. Articulating solutions to the tragedy of the commons is one of the main problems of political philosophy. In many situations, locals implement (often complex) social schemes that work well. The best governmental solution may be to do nothing. When these fail, there are many possible governmental solutions such as privatization, internalizing the externalities, and regulation. Political scientist Elinor Ostrom, who was awarded 2009’s Nobel Memorial Prize in Economic Sciences for her work on the issue, and others revisited Hardin’s work in 1999. They found the tragedy of the commons not as prevalent or as difficult to solve as Hardin maintained, since locals have often come up with solutions to the commons problem themselves. For example, it was found that a commons in the Swiss Alps has been run by a collective of farmers there to their mutual and individual benefit since 1517, in spite of the farmers also having access to their own farmland. In general, it is in the interest of the users of a commons to keep them functioning and so complex social schemes are often invented by the users for maintaining them at optimum efficiency. Similarly, geographer Douglas L. Johnson remarks that many nomadic pastoralist societies of Africa and the Middle East in fact “balanced local stocking ratios against seasonal rangeland conditions in ways that were ecologically sound”, reflecting a desire for lower risk rather than higher profit; in spite of this, it was often the case that “the nomad was blamed for problems that were not of his own making and were a product of alien forces.” Independently finding precedent in the opinions of previous scholars such as Ibn Khaldun as well as common currency in antagonistic cultural attitudes towards non-sedentary peoples, governments and international organizations have made use of Hardin’s work to help justify restrictions on land access and the eventual sedentarization of pastoral nomads despite its weak empirical basis. Examining relations between historically nomadic Bedouin Arabs and the Syrian state in the 20th century, Dawn Chatty notes that “Hardin’s argument […] was curiously accepted as the fundamental explanation for the degradation of the steppe land” in development schemes for the arid interior of the country, downplaying the larger role of agricultural overexploitation in desertification as it melded with prevailing nationalist ideology which viewed nomads as socially backward and economically harmful. Elinor Ostrom and her colleagues looked at how real-world communities manage communal resources, such as fisheries, land irrigation systems, and farmlands, and they identified a number of factors conducive to successful resource management. One factor is the resource itself; resources with definable boundaries (e.g., land) can be preserved much more easily. A second factor is resource dependence; there must be a perceptible threat of resource depletion, and it must be difficult to find substitutes. The third is the presence of a community; small and stable populations with a thick social network and social norms promoting conservation do better. A final condition is that there be appropriate community-based rules and procedures in place with built-in incentives for responsible use and punishments for overuse. When the commons is taken over by non-locals, those solutions can no longer be used. Governmental solutions may be necessary when the above conditions are not met (such as a community being too big or too unstable to provide a thick social network). Examples of government regulation include privatization, regulation, and internalizing the externalities. One solution for some resources is to convert common good into private property, giving the new owner an incentive to enforce its sustainability. Libertarians and classical liberals cite the tragedy of the commons as an example of what happens when Lockean property rights to homestead resources are prohibited by a government. They argue that the solution to the tragedy of the commons is to allow individuals to take over the property rights of a resource, that is, to privatize it. In England, this solution was attempted in the Inclosure Acts. In a typical example, governmental regulations can limit the amount of a common good that is available for use by any individual. Permit systems for extractive economic activities including mining, fishing, hunting, livestock raising and timber extraction are examples of this approach. Similarly, limits to pollution are examples of governmental intervention on behalf of the commons. This idea is used by the United Nations Moon Treaty, Outer Space Treaty and Law of the Sea Treaty as well as the UNESCO World Heritage Convention which involves the international law principle that designates some areas or resources the Common Heritage of Mankind. In Hardin’s essay, he proposed that the solution to the problem of overpopulation must be based on “mutual coercion, mutually agreed upon” and result in “relinquishing the freedom to breed”. Hardin discussed this topic further in a 1979 book, Managing the Commons, co-written with John A. Baden. He framed this prescription in terms of needing to restrict the “reproductive right“, to safeguard all other rights. Several countries have a variety of population control laws in place. German historian Joachim Radkau thought Hardin advocates strict management of common goods via increased government involvement or international regulation bodies. An asserted impending “tragedy of the commons” is frequently warned of as a consequence of the adoption of policies which restrict private property and espouse expansion of public property. Privatization works when the person who owns the property (or rights of access to that property) pays the full price of its exploitation. As discussed above negative externalities (negative results, such as air or water pollution, that do not proportionately affect the user of the resource) is often a feature driving the tragedy of the commons. Internalizing the externalities, in other words ensuring that the users of resource pay for all of the consequences of its use, can provide an alternate solution between privatization and regulation. One example is gasoline taxes which are intended to include both the cost of road maintenance and of air pollution. This solution can provide the flexibility of privatization while minimizing the amount of government oversight and overhead that is needed. The environmentalist Derrick Jensen claims the tragedy of the commons is used as propaganda for private ownership. He says it has been used by the political right wing to hasten the final enclosure of the “common resources” of third world and indigenous people worldwide, as a part of the Washington Consensus. He argues that in true situations, those who abuse the commons would have been warned to desist and if they failed would have punitive sanctions against them. He says that rather than being called “The Tragedy of the Commons”, it should be called “the Tragedy of the Failure of the Commons”. Hardin’s work was also criticised as historically inaccurate in failing to account for the demographic transition, and for failing to distinguish between common property and open access resources. In a similar vein, Carl Dahlman argues that commons were effectively managed to prevent overgrazing. Likewise, Susan Jane Buck Cox argues that the common land example used to argue this economic concept is on very weak historical ground, and misrepresents what she terms was actually the “triumph of the commons”: the successful common usage of land for many centuries. She argues that social changes and agricultural innovation, and not the behaviour of the commoners, led to the demise of the commons. Some authors, like Yochai Benkler, say that with the rise of the Internet and digitalisation, an economics system based on commons becomes possible again. He wrote in his book The Wealth of Networks in 2006 that cheap computing power plus networks enable people to produce valuable products through non-commercial processes of interaction: “as human beings and as social beings, rather than as market actors through the price system”. He uses the term networked information economy to refer to a “system of production, distribution, and consumption of information goods characterized by decentralized individual action carried out through widely distributed, nonmarket means that do not depend on market strategies.” He also coined the term commons-based peer production for collaborative efforts based on sharing information. Examples of commons-based peer production are free and open source software and open-source hardware. In certain cases, exploiting a resource more may be a good thing. Carol M. Rose, in a 1986 article, discussed the concept of the “comedy of the commons”, where the public property in question exhibits “increasing returns to scale” in usage (hence the phrase, “the more the merrier”), in that the more people use the resource, the higher the benefit to each one. Rose cites as examples commerce and group recreational activities. According to Rose, public resources with the “comedic” characteristic may suffer from under-investment rather than over usage. Prisoner’s Dilemma, wherein two parties may each act in an individually beneficial fashion to the detriment of both. Stone Soup, the inverse of the tragedy. ^ Lloyd, William Forster (1833). Two lectures on the checks to population. England: Oxford University. Retrieved 2016-03-13. ^ a b c Hardin, G (1968). “The Tragedy of the Commons” (PDF). Science. 162 (3859): 1243–1248. doi:10.1126/science.162.3859.1243. PMID 5699198. ^ Management, National Research Council (U S. ) Panel on Common Property Resource (1986). “Proceedings of the Conference on Common Property Resource Management, April 21-26, 1985”. National Academies. ^ “Elinor Ostrom – Facts”. www.nobelprize.org. Retrieved 2018-08-15. ^ Clark, John (2016). Tragedy of Common Sense. Changing Suns Press. p. 61. ISBN 9780995155121. ^ Daly, Herman E.; Farley, Joshua (2011). Ecological Economics. Principles and Applications (PDF contains full textbook) (2nd ed.). Washington: Island Press. ISBN 9781597266819. ^ Lloyd, William Forster (1833). “Two Lectures on Population”. Population and Development Review. 6 (3): 473–496. JSTOR 1972412. ^ Abstract: “The population problem has no technical solution; it requires a fundamental extension in morality”. ^ a b c Hardin, G. (1968-12-13). “The Tragedy of the Commons” (PDF). Science. 162 (3859): 1243–1248. doi:10.1126/science.162.3859.1243. PMID 5699198. Retrieved 22 October 2013. it is the role of education to reveal to all the necessity of abandoning the freedom to breed. Only so, can we put an end to this aspect of the tragedy of the commons. ^ “The Universal Declaration of Human Rights”. 10 December 1948. Retrieved 4 September 2011. ^ Hesse, Stephen (2006-07-26). “Will commons sense dawn again in time? | The Japan Times Online”. The Japan Times Online. Search.japantimes.co.jp. Retrieved 22 October 2013. ^ Hardin, Garrett (May 1, 1998). “Extensions of “The Tragedy of the Commons““. Science. 280 (5364): 682–683. doi:10.1126/science.280.5364.682. ^ “Brigham Daniels, Emerging Commons Tragic Institutions”. Environmental Law. 37: 515–571 at 536. 2007. SSRN 1227745. ^ C.Michael Hogan. 2010. Overfishing. Encyclopedia of Earth. National Council for Science and the Environment. eds. Sidney Draggan and C.Cleveland. Washington DC. ^ ch 11–12. Mark Kurlansky, 1997. Cod: A Biography of the Fish That Changed the World, New York: Walker, ISBN 0-8027-1326-2. ^ Flockers, Small (15 January 2016). “Small Flock Poultry Farmers of Canada: MCR-1: Tragedy of the Commons for Antibiotics”. ^ Prause, Christian (September 5, 2011). “Reputation-based self-management of software process artifact quality in consortium research projects”. Proceedings of the 19th ACM SIGSOFT symposium and the 13th European conference on Foundations of software engineering – SIGSOFT/FSE ’11. ACM. p. 380. doi:10.1145/2025113.2025166. ISBN 9781450304436. Retrieved 22 October 2013. ^ Stephane Kasriel (2017-07-31). “Skill, re-skill and re-skill again. How to keep up with the future of work”. World Economic Forum. ^ Rankin, Daniel J. (2005). “Can adaptation lead to extinction?”. Oikos. 111 (3): 616–619. CiteSeerX 10.1.1.692.9713. doi:10.1111/j.1600-0706.2005.14541.x. ^  Ibrahim, Ahmed (2015): The tragedy of the commons and prisoner’s dilemma may improve our realization of the theory of life and provide us with advanced therapeutic ways. figshare. ^ Druzin, Bryan (2016). “A Plan to strengthen the Paris Agreement”. Fordham Law Review. 84: 19–20. ^ Kopelman, Weber, & Messick, 2002. ^ Weber et al., 2004. ^ Myers & Kopelman, 2012. ^ “A Smiley Face Emoticon For Your Electric Bill | Unambiguously Ambidextrous”. Unambig.com. Archived from the original on 2011-08-31. Retrieved 22 October 2013. ^ Axelrod, Robert (1984). The Evolution of Cooperation. New York: Basic Books. ISBN 978-0-465-02121-5. ^ Appell, G. N. (1993). Hardin’s Myth of the Commons: The Tragedy of Conceptual Confusions. Working Paper 8. Phillips, ME: Social Transformation and Adaptation Research Institute. ^ Ostrom, Elinor; Burger, Joanna; Field, Christopher B.; Norgaard, Richard B.; Policansky, David (1999). “Revisiting the Commons: Local Lessons, Global Challenges” (PDF). Science. 284 (5412): 278–282. CiteSeerX 10.1.1.510.4369. doi:10.1126/science.284.5412.278. PMID 10195886. ^ a b “Ostrom ‘revisits the commons’ in ‘Science‘“. Archived from the original on 2012-03-05. ^ Smith, Vernon L. “Governing The Commons”. ^ a b Johnson, Douglas L. (1993). “Nomadism and Desertification in Africa and the Middle East”. GeoJournal. 31 (1): 51–66. doi:10.1007/bf00815903. ^ Chatty, Dawn (2010). “The Bedouin in Contemporary Syria: The Persistence of Tribal Authority and Control”. Middle East Journal. 64 (1): 29–69. doi:10.3751/64.1.12. ^ John Locke, “Sect. 27” and following sections in Second Treatise of Government (1690). Also available here. ^ “Managing the Commons by Garrett Hardin and John Baden”. Ecobooks.com. Retrieved 22 October 2013. ^ Radkau, Joachim. Nature and Power. A Global History of the Environment. Cambridge University Press. 2008. ^ Mirovitskaya, N.; Soroos, M. S. (January 1995). “Socialism and the Tragedy of the Commons: Reflections on Environmental Practice in the Soviet Union and Russia”. The Journal of Environment Development. 4 (1): 77–110. doi:10.1177/107049659500400105. ^ Perry, Mark (June 1995). “Why Socialism Failed”. The Freeman. 45 (6). ^ Harvey, David (2011). “The future of the commons”. Radical History Review. 2011 (109): 101–107. doi:10.1215/01636545-2010-017. ^ Dasgupta, Partha. “Human Well-Being and the Natural Environment”. Retrieved 2016-03-13. ^ Dahlman, Carl J. (1991). “The tragedy of the commons that wasn’t: On technical solutions to the institutions game”. Population and Environment. 12 (3): 285–296. doi:10.1007/BF01357919. ^ Benkler, Yochai (2006). The Wealth of Networks: How Social Production Transforms Markets and Freedom. New Haven, Conn: Yale University Press. p. 3. ISBN 978-0-300-11056-2. ^ Steven Johnson (September 21, 2012). “The Internet? We Built That”. New York Times. Retrieved 2012-09-24. The Harvard legal scholar Yochai Benkler has called this phenomenon ‘commons-based peer production’. ^ Rose, Carol M. (1986). “The Comedy of the Commons: Commerce, Custom, and Inherently Public Property”. Faculty Scholarship Series, Yale Law School. Paper 1828. Angus, I. (2008). “The myth of the tragedy of the commons”, Socialist Voice (August 24). Chatty, Dawn (2010). “The Bedouin in Contemporary Syria: The Persistence of Tribal Authority and Control”. Middle East Journal. 64 (1): 29–69. doi:10.3751/64.1.12. Foddy, M., Smithson, M., Schneider, S., and Hogg, M. (1999). Resolving social dilemmas. Philadelphia, PA: Psychology Press. Messick, D. M.; Wilke, H. A. M.; Brewer, M. B.; Kramer, R. M.; Zemke, P. E.; Lui, L. (1983). “Individual adaptations and structural change as solutions to social dilemmas”. Journal of Personality and Social Psychology. 44 (294): 309. doi:10.1037/0022-3514.44.2.294. Johnson, Douglas L. (1993). “Nomadism and Desertification in Africa and the Middle East”. GeoJournal. 31 (1): 51–66. doi:10.1007/bf00815903. Kopelman, S., Weber, M, and Messick, D. (2002). “Factors Influencing Cooperation in Commons Dilemmas: A Review of Experimental Psychological Research”. In E. Ostrom et al., (Eds.) The Drama of the Commons. Washington DC: National Academy Press. Ch. 4., 113–156. Kopelman, S (2009). “The effect of culture and power on cooperation in commons dilemmas: Implications for global resource management”. Organizational Behavior and Human Decision Processes. 108 (1): 153–163. doi:10.1016/j.obhdp.2008.06.004. Locher, Fabien (2013). “Cold War Pastures: Garrett Hardin and the ‘Tragedy of the Commons‘“ (PDF). Revue d’Histoire Moderne et Contemporaine. 60 (1): 7–36. Bryan Jones, B. J., and Howard Rachlin, H. R. (2006). “Social discounting”. Psychological Science 17(4), 283–286. Retrieved from http://evolution.binghamton.edu/evos/wp-content/uploads/2009/08/Rachlin1.pdf. Rachlin, H (1974). “Self-control”. Behaviorism. 2: 94–107. Rachlin, H.; Green, L. (1972). “Commitment, choice, and self-control”. Journal of the Experimental Analysis of Behavior. 17 (1): 15–22. doi:10.1901/jeab.1972.17-15. PMC 1333886. PMID 16811561. Van Vugt, M. (2001). “Community identification moderating the impact of financial incentives in a natural social dilemma”. Personality and Social Psychology Bulletin. 27 (11): 1440–1449. doi:10.1177/01461672012711005. Van Vugt, M. (2009). “Triumph of the commons: Helping the world to share”. New Scientist (2722): 40–43. Weber, M.; Kopelman, S.; Messick, D. (2004). “A conceptual review of decision making in social dilemmas: applying the logic of appropriateness”. Personality and Social Psychology Review. 8 (3): 281–307. doi:10.1207/s15327957pspr0803_4. PMID 15454350. Archived from the original on 2012-10-14. Hardin, G. (1994). “The Tragedy of the Unmanaged Commons”. Trends in Ecology & Evolution. 9 (5): 199. doi:10.1016/0169-5347(94)90097-3. PMID 21236819. Hardin, Garrett (2008). “Tragedy of the Commons”. In David R. Henderson. Concise Encyclopedia of Economics (2nd ed.). Indianapolis: Library of Economics and Liberty. ISBN 978-0865976658. OCLC 237794267. Retrieved 2016-03-13.